What Are The Best Online Master's in Online Teaching Programs? What Else Can I Expect From an Online Master's in Online Teaching Program? Teaching is an ideal profession for those passionate about working with children and/or adults, and who enjoy helping others develop the knowledge and skills to serve them throughout their lives. It's also an ideal career for those who enjoy a dynamic work environment and like the idea of having summers off. Fortunately, the Bureau of Labor Statistics projects that 1.9 million teaching jobs will be added to the American economy in the next decade, making this a field in need of new talent. The expansion of online teaching initiatives also means teachers must be capable of providing distance educations. CUC offers a MA in blended and online teaching for PK-12 educators that is ideal for K-12 teachers seeking to increase their pedagogy, creativity, and instructional mastery. This 30-credit master's degree in teaching online can be completed in 24 months and includes coursework on web tools for educators, learning theories and online instructional strategies, instructional design for digital learning, assessment for online learners, and the teacher as researcher. Students must also complete a capstone project that demonstrates their mastery of content learned in the program. The program’s curriculum is aligned with both the standards of the International Association for K-12 Online Learning and the International Society for Technology in Teaching. Applicants must have a bachelor's degree with a minimum GPA of 2.85 and a teacher certification to be considered. CUC is accredited by the Higher Learning Commission. Wilkes University has partnered with PLS 3rd Learning to offer a 30-credit online master's degree in teaching. The program is delivered entirely online and emphasizes mastery of instructional design, assessment, and community-building. Wilkes has been approved by Pennsylvania's Department of Education to offer an online instruction endorsement. Courses are offered in seven- and eight-week sessions and cover a variety of topics, including using technology for assessment, using emerging technologies to improve learning, facilitating online learning communities, blended and synchronous learning environments, and developing online programs. Students can transfer a maximum of six credits of graduate-level coursework towards their master's in teaching online degree. Applicants must have a bachelor's degree, preferably with an education major, to be considered. They must also have a strong academic record and a copy of their state teaching certificate. Students must apply to both Wilkes and PLS 3rd Learning separately. Wilkes is accredited by the Middle States Commission on Higher Education. DBU is a private Christian university that was founded in 1898 in Dallas, Texas. The school was the first two-year college in the state and offers a variety of online programs, including a master's of arts in teaching online with a 15-credit specialization in distance learning. The curriculum includes coursework on a variety of topics, such as the foundations of distance learning, developing and designing curriculum for distance learners, teaching and learning at a distance, and tech tools for the online classroom. There is also a 12-credit professional development component that includes study of education research, improving instruction, curriculum design and evaluation, and supervision of instruction. This master's of arts in teaching online does not lead to teacher certification in Texas. Applicants must have a bachelor's degree and submit competitive GRE scores to be considered. DBU is accredited by the Southern Association of Colleges and Schools Commission on Colleges. CSU East Bay offers a 30-credit MS in education in online teaching and learning that is ideal for those seeking to become effective educators in virtual classrooms. The 10 courses in this master's in teaching online teach students how to convert teaching materials into an online mode of delivery. This program is designed for adult learners who want to earn a degree at their own pace. Courses are delivered through Blackboard and the program can be completed in as few as 15 months. The curriculum includes courses on a variety of topics, such as teaching tools for online instruction, designing the online curriculum, research in online teaching and learning, and building the online environment. Those who have already earned an online teaching and learning certificate can apply it towards their degree, requiring only six courses to earn their degree. Applicants must have a bachelor's degree with a minimum GPA of 3.0 and be a subject matter expert with teaching experience in any field to be considered. CSU East Bay is accredited by the Western Association of Schools and Colleges. Drury offers a master's of education in online teaching that prepares students to become experts in designing and administering an online learning experience with cutting-edge technology. This 36-credit program can be completed entirely online. Students learn how to combine instructional methodologies with new technology through the study of online pedagogy, simulation and virtual reality, instructional delivery and design, educational evaluation, and educational technology. Distance learners must also complete a capstone project within the last nine credits of the program in which they demonstrate mastery of their speciality area. Drury has accredited online options to facilitate teacher certification for students who are not already certified teachers. Applicants to this master's in teaching online must have a bachelor's degree with a minimum GPA of 2.75 to be considered. Drury is accredited by the Higher Learning Commission. Yes! A master of arts in teaching online benefits two types of students: those who hold undergraduate degrees unrelated to teaching, but who want to gain their initial certification; and those who have an undergraduate teaching degree but would like to advance in their careers. No. Because students who pursue this degree possess a variety of academic backgrounds, previous teaching experience is not required. Students may, however, be required to take prerequisite courses before being admitted to the main degree track. A master's in teaching online program offers numerous options for specialization or concentration, such as administration, curriculum design, instructional leadership, special education, or other specific subjects. Some programs let students progress through coursework individually, while others use a cohort model. Because of these factors, prospective students should identify their interests and then locate a program aligned with those needs. Can I Work While I Complete My Online Master's In Online Teaching? Yes. Many students within master of arts in teaching online program continue working while enrolled -- either as teachers or other unrelated roles. Many teachers begin their programs in the summer, allowing them to acclimate to the workload during a traditionally less busy time. Most programs suggest students set aside nine to 12 hours per week to study, per class taken. An online master's in teaching prepares graduates to be competent and competitive educators, while providing working professionals the flexibility to manage personal and professional responsibilities alongside coursework. Master's in teaching online programs have many courses in common, but students should be aware that details can vary based on the individual school and program chosen. The courses reviewed below are provided as examples. Educational Technology: This foundational course introduces new students to the array of educational technologies and how they can be incorporated into diverse digital classrooms. Topics include relevant software, uses of the internet, internet safety, and incorporating communication technologies such as webinars, forums, and teleconferencing. Global eLearning: It is common to have international learners in many online classes. This course provides global perspectives of learning, considers common topics within international education, and provides future online teachers with tools to serve students unaccustomed to the American school system. Instructional and Curriculum Design: Students enrolled in this class learn to lesson plan and develop teaching strategies for diverse communities of students. Special focus is given to ensuring that lesson plans meet performance assessment requirements. 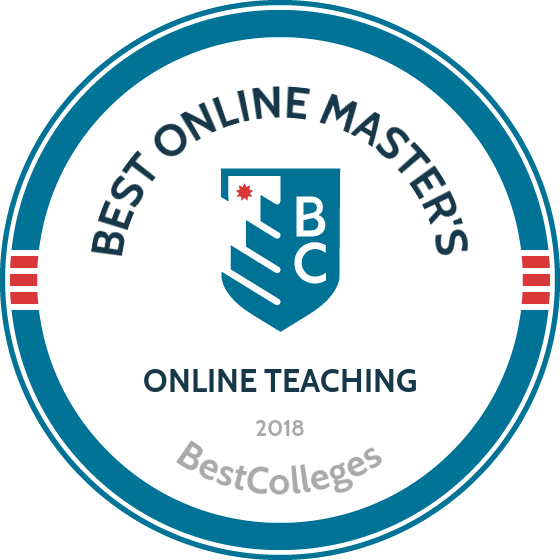 How Long Does It Take To Get An Online Master's In Online Teaching? A number of program characteristics affect the length of a master of arts in teaching online, including self-paced versus cohort learning, available concentrations, and whether the program is offered on a part- or full-time basis. Individual student factors should also be considered, including whether they have previous experience in online education. Many master's in teaching online are offered in a cohort model, where students begin the program with a group of peers and progress through coursework together. This style is typically more rigid in its timeline since no student can move ahead or fall behind individually. The majority of master's in teaching online programs can be completed in 12 months, but prerequisites, part-time learning, and student teaching experiences can extend a program up to two years. Every state in America requires primary and secondary teachers to gain licensure from the state Board of Education. Different states have different requirements, so students should keep these in mind while completing their degree and deciding where to teach. Online college teachers aren't required to receive licensure, but they typically require a master's or doctoral degree to be qualified for employment. Outside of required licensure, many primary and secondary online teachers complete additional certificates to build their skills and experience. Teaching English As a Foreign Language TEFL certification allows individuals to work with non-native English speakers, whether located in a traditional school system, an online classroom, or in an international language learning institute. Special Education Teachers aspiring to work with exceptional students can complete SPED certification to learn about current issues in the field, how to perform diagnostic assessments, and ways to serve students with behavioral, cognitive, emotional, or social disorders. Accreditation assesses whether a school or program is serving students well, academically, financially, and personally. Regional and national accreditation are the standard assessments, while field-specific assessments focus on individual degrees or departments. When choosing between schools that are regionally or nationally accredited, students should identify those that have gone through the more rigorous process of achieving (and maintaining) regional accreditation. National accreditation standards tend to be less labor-intensive and have lower bars for achieving a passing score. As well, students can find it difficult to transfer credits or gain certification from nationally accredited schools. Field-specific accreditations are very common in some academic disciplines, while less common in others. Teaching has numerous accrediting agencies for the field, including the Council for Accreditation of Educator Preparation and the National Council for the Accreditation of Teacher Education. Prospective or current students interested in learning about the accreditation process and how these agencies are held accountable should contact the U.S. Department of Education and/or the Council for Higher Education Accreditation. These departments ensure accrediting groups maintain high standards, and each makes public a list of all accredited schools. These can be found on the DOE or CHEA websites. Comprehensive data on online teaching positions is still scarce, but data about student growth within online education shows that more teachers are needed for online learning platforms to meet increased demand. Data from the National Center for Educational Statistics is used below to highlight these trends. In addition to individual workplaces, professional experience levels impact the annual earnings of employees in the educational administration field. The next table features data from PayScale regarding expected salaries for school principals, college deans, and other administrative staff at different stages of their respective careers. The careers below show the full span of career options available to graduates of master's in teaching online programs. Though teaching roles typically require only a bachelor's degree and a teaching license, any of the managerial roles highlighted require competitive candidates to hold advanced teaching degrees. As the name suggests, high school teachers work with students in grades 9-12, teaching academic lessons and skillsets that prepare students to immediately enter the job market or into a college degree program. Responsibilities include lesson planning, student evaluation, communicating with parents, and working with individual students who need additional assistance or accommodations. Working with younger students, these types of educators often teach all main subjects within one classroom rather than rotating students and teaching a single subject. As such, they are responsible for educating students in areas of reading, math, the sciences, and social studies. Rather than spending their days in the classroom, principals at the primary and secondary levels oversee all of the administrative and operational frameworks to ensure teachers have the support and structure to thrive. They also coordinate overarching curriculum, manage all staff, ensure students have a safe learning environment, and communicate with parents. Teachers are responsible for daily lesson plans, but instructional coordinators create textbooks or other learning tools as result of student test data and research. They may also host training conferences to educate teachers on new curricula standards, mentor teachers, and develop procedures to introduce new teaching materials to the classrooms. School librarians order books to complement learning plans, and work directly with students to ensure materials within the library are used appropriately. They help students find materials related to their subject area, provide training on how to use reference materials, or oversee after-school or summer reading programs. Educating the next generation is a demanding and rewarding job, and professional organizations provide support, education, advocacy, and protection to teachers. Many of these groups offer opportunities for fellow teachers to gather at annual conferences, complete required continuing education credits, and locate fulfilling teaching positions. As America's largest professional employment organization, NEA serves the interest of more than three million members via state and county chapters. ILA works with more than 300,000 literacy teachers, researchers, and experts in 84 countries. The association provides training, accreditation, continuing education, and grants. The largest non-union association for educators, AAE serves teachers in all 50 states. Member benefits include various types of insurance, legal protection, scholarships and grants, newsletters, and professional resources. Graduate school isn't cheap, and many students may be concerned about taking on excessive student debt for their education. Fortunately, teachers have many funding options available to them. The Free Application for Federal Student Aid (FAFSA) is an annual form students complete to learn about federal scholarships, grants, loans and work-study programs available to them -- including TEACH grants. Other funding sources include private foundations, nonprofits, and departmental scholarships distributed on the basis of need or merit.